This beautiful album is proof, were it ever needed, that the beauty of the human voice can shine through even when very little adornment in instrumentation is added. Of course, you need good songs and this collection has an abundance of those with four being written by lead vocalist Sarah Hawker, four traditional and two by harmony vocalist Debra Clifford. It’s strange how we seem to accept that the lead vocalist has priority and harmonies can be almost an afterthought but on this album they have equal billing. The way their voices fit together is as near perfect as human voices can be and it is those beautiful vocals that give the album it’s strength and the edginess that lifts it way above the rest of the field. The fact that both women are exceptional songwriters and instrumentalists just adds to the feeling that this album is very special. Sarah plays guitar, harmonium and clawhammer banjo whilst Debra plays guitar, gourd banjo, guitar, mandolin, tenor guitar and clawhammer banjo. Simplicity is the key if the artists have confidence in what they are trying to achieve and in their ability as performers. A recording as sparse as this and so reliant on their vocal abilities can and often does go horribly wrong. Fortunately, in the case of these two hugely talented women the reverse applies. The album is a triumph for the edginess of uncluttered folk music and for the Lonesome Sisters imagination in carrying it through. This is their fourth album release, but only the second on which there has been just the two of them. On their first album they were accompanied by Riley Baugus, with whom they are are currently working on a follow up and they also made an album with ‘Uncle Earl’ member, Rayna Gellert. The quality of Riley and Rayna gives a clue as to the quality of what can be expected from the Lonesome Sisters with them also being steeped in ‘old timey’ folk music. Sarah comes from a long line of traditional singers and is a prize winning songwriter herself, hardly surprising when you hear the songs on this album and Debra is just as steeped in old timey, also being a teacher of rhythm guitar, mandolin and harmony singing. This harmony singing is one of the elements that makes the album tug so much at the heartstrings, adding a tremendous amount of power to these songs that have a minimum of outside colouring by way of instrumentation. The already mentioned instrumentation that is used is played with such expertise that the use of anything else to fill out the sound would detract from the beauty of this tremendous set of recordings. The songs themselves are evocative of classic ‘old timey’ but in a modern setting that removes the feeling that this is just ‘old fashioned music’ that has no relevance. Even the four songs not from the pens of the Lonesome Sisters are as relevant today as they were decades ago and the originals from the two women blend seamlessly with the old songs, producing an album of rare beauty. Sarah’s album opener Deep Water is a sparse acoustic guitar led, sad, old timey song that works as a piece of poetry just as much as it does a song and is followed by some beautifully haunting banjo on the evocative ‘front porch’ throwback Peachtree, again written by Sarah. There are a couple of excellent songs that can be classed as instrumentals, with the first being Horace & Willamina on which Sarah plays clawhammer banjo and Debra guitar, with them harmonizing on and repeating the title names and Oooh Song, fairly obviously consisting of lots of ooooohs, but with Debra showing her expertise on the gourd banjo! 20 Doors is agorgeous slow, moving ballad with yet more poeticism in the lyrics this time from the pen of Debra, with Sarah on lead vocals and harmonium and Debra again adding some beautiful harmonies as well as tenor guitar. Sadly, the majority of the commercial music industry proves regularly that they are not ready to promote music of this quality, instead preffering to put their millions behind manufactured pop. I’ve played this album to at least twenty people of varying ages and tastes and each and every one has recognized the huge quality inherent in these sparse recordings. 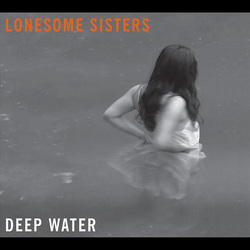 Even the sad songs seem to have a calming effect that provokes what is best described as a meditative feel in the listener and long may the Lonesome Sisters continue to make music this good!